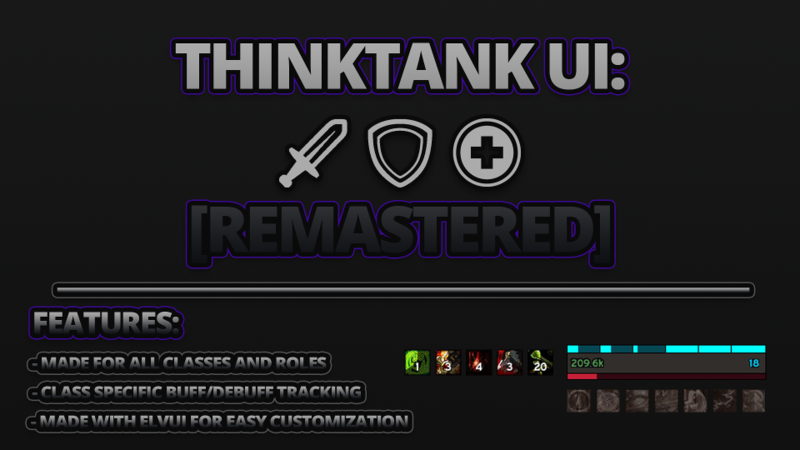 ThinkTankUI: [Remastered] is a graphical addon compilation for World of Warcraft. The UI focuses on providing the user with real time buff/debuff tracking for every class, role, and specialization. The base of the interface is built upon ElvUI and can be customized differently for each and every person who uses the UI. If you are looking for something new and refreshing, this UI might be exactly what you had in mind! You should complete the original ElvUI Installer, at least through the chat, and then you literally follow the steps of the ThinkTankUI Remastered installer to ensure your UI is installed correctly. The command /ttuirm will also bring up the menu for the installer in case you delete a profile or close the installer. The installer will create a profile for you to use based on the choices made within the installer. If you want to have more than one layout (a healer and dps/tank layout) then you will need to make more than one profile. Enjoy the UI and please make me aware of any bugs by sending me a message at [email protected] or by posting on wowinterface, tukui, or curseforge. I wish you all the best and happy demon hunting! Contact me at [email protected] or by leaving comments on the page! You can also post bugs in the Discord. Credits: Elv, Tukz, Gallahead, Dandruff, MilkeProd, Tojaso, Tonyleila, Mave 99, Zarnivoop, Cladhaire, Azilroka, Skullflower, Nibelheim, Darth Predator, Blazeflack, Merathilis, and Simpy. and the entire ElvUI Community who puts forth amazing effort to make this game a success by showcasing some amazing talent. -Fixed the "bug" where there was conflicting anchor points on the player frame with the buffs and debuffs (even with them disabled) You will need to run through the installer again though to get it to work. -Slightly adjusted a few frames but no major changes. -adding a video to youtube to show you how to use the Kui Nameplates profile that I made for the UI (or you can use the nameplates I made in ElvUI (which will install by default). -Removed XIV Databar due to nearly every button on it being a part of the UI in some other place. -Reworked the few issues that the unitframes had in regards to where/how the text is shown. Added Support for AddonSkins for DBM and adjusted the bars so they look correct. -Updated the entire installation process to make everything much smoother for installation. -Added in a second set of actionbars so there is a little more choice. -Moved the minimap back to the right hand side. If I want to make an option for either I could but currently raven is attached to the minimap and the buffs don't slide down automatically when in your class halls. -In order to prevent Errors from popping up when the Raid Bar and Special Buff bar is up, make sure to have /luaerror off or have a bug grabber addon. These to bars work like they should but blizzard changed how they collect tooltip data a while back and it is causing an issue just with those two bars. -I'm in the process of adding in another unitframe just in case a second choice is wanted. -Bug fixes and much much more. I reverted back to the class specific buff tracking after rolling back a few versions and it all seems to be working fine. -I moved the map back to the left like I said I would after things got fixed with XIVDatabar. -I adjusted a number of settings in the player, target, party, and raid frames. Things should go a lot smoother. -I adjusted the size of the small action bars to better accommodate the spells being shown. -Fixed the Raid Buffs Bar and the Special Buffs Bar to work properly. -In order to make future updates easier, I revamped the profile management system to better handle updates. You will no longer need to delete profiles, rather, they will be overwritten with new ones after running the installer again. -I moved Skada to the bottom right and gave it two windows for ease of access/tracking ability. -In order to accommodate Skada, I moved trade chat to the left chat bar and made it wider. -Finally, I made many small bugs fixed that should improve the QoL of this suite. Looking forward to working with you all to make this a success! -Removed all custom buff bars from raven. There are too many issues within the custom bars to make them work correctly, until raven is updated for BFA, but the automatic bars seem to work fine. -I added semi-customized auto bars for everything that I removed. Everything should work as it should but you will need to delete your raven profiles and reinstall them with /ttuirm and click on the addon profiles tab. -Thanks for the support everyone. Good luck out there. Stay tuned to a custom project of mine! They were not showing properly due to incorrect spell ids. That is now resolved. The Removal of these two frames was to get rid of all the errors they were throwing. In the meantime I have added in a new bar to the top left that is invisible but it will track Long Buffs (Raid Buffs) and anything over 2 minutes long up to 10 buffs. If the time is not long enough I will set it to track buffs over 5 minutes. Second, the bar that had the special buffs (usually long CDs that could save your life) would show if you were targeted by one of these buffs but with the recent update it broke the system for that bar and I cannot fix it. In the meantime I will be researching a way to make everything work how I want. Look forward to changes in the future (I'll play around with many buff tracking programs i.e. Vuhdu, Weakauras 2, and so on). To install this you need to type /raven and go to profiles and delete your current profile for that character and then run the installer again by typing /ttuirm and go to the addon profile install portion and run that again to add in the changes. I look forward to working hard to makes things amazing. -Generalized Bug Fixes with the Update to the new ElvUI. I checked all the profiles and settings to make sure everything is in working order. If you are having any issues of problems please send them to me ASAP so I can get to work on those things. -Made a QoL change by making it so that almost all the addons will now make profiles based on your character name (i.e. maximus-ThinkTankUI). There was some issues switching profiles so I fixed the issue by allowing profiles to be made per character, with the exception of DBM because it worked fine. You can either keep the old profiles or just run /ttuirm and go to the addons section and click the addon profile installer to add the newly named profiles. - Correctly configured the Details addon install data to actually work. I forgot a _ in the code. -I removed the config.lua and added the /ttuirm right in to the install file to prevent the game from not loading the installer on the first login of a character. -Reworked Skada slightly to work better for those of you who could not click it to change modes. -Modified the installation process so that it will now add your character name before the profile name "ThinkTankUI" so that you can now make multiple profiles. -The INSTALLER UPDATE! This is the first update where an installer is available for everyone. -I updated the raid buff locations. -Attached the raven functions to the Unit Frames, thus just switching profiles will move the tracking frames automatically. -Added some missing or misnamed spell IDs for the tracking system. -Added a Healing profile for those of you who wanted one. -Added support for the Details Addon. The profile will have to be manually selected but it is set up to work with the UI currently. -I removed an older version of the XIV Databar which was not allowing people to Shift/Right Click their artifact weapons in the character window. A new version has been added. -Re-positioned the XCT+ windows so they are not "off"
-Reconfigured the updated version of XCT+ so that it should work with the latest version of the addon. *Note- I do not currently play WoW but my wife still does so I will be trying to have regular updates on this as much as I can. -Added in the buff for the Resto Druid Artifact Weapon. I went through to make sure all the druid heals show on the party/raid frames too. -Should be the last modification/move of the ElvUI Frames so after this no more updating the saved variables! YAY! -Looking to get a stream up and going SOON! I've been testing the stream already, I'll keep you posted. -Quick fix for the Databar. It is moved to the bottom, thus I had to move everything else upwards, even if that was the last thing I wanted to do. -There are a few small changes, I.E. ElvUI Player Frames are hidden Out of Combat. -Raven Bars on the player are now hidden Out of Combat. -final Fixes on a few small things before Legion Drop. -Fixed some class profiles in Raven that I missed in the last update. -Updated All Addon Profiles to be named ThinkTankUI. Nice work! This UI is fantastic. 1) I'm getting an error about Elv UI player frames having a conflicting anchor point - both buff and debuff have the same anchor. 2) I seem to have two nameplates on mobs. Dunno if I did something wrong or not. I'll check some more. Kui Nameplates is an optional addon. If you want to use it, I am uploading a video today on how to use the profile I made for it. I could not get the addon to install the profile automatically so I am showing you how to do it manually. Also, I am uploading the fix for the Anchor Points error. Any plans on an update soon? Will you be updating this for 8.0? do u happen to kno where this would b? Last edited by kryptek : 07-10-18 at 07:21 PM. after upgrading to 3.1 i got LUA-Errors by setup the Class-Layout and after Installation no changes to the Unitframes. A new Setup by delete WTF-Folder doesn't work. Also Skada Layout fails too. Sry 4 my terrible English and hope u can read out what i want to say. If I don't get any report on the error, it is hard to see what the issue might be. Do you have any logs from the issue? also, when was the last time you updated ElvUI itself? Thanks for hint. Next time.... Awesome. I was running ElvUI 10.72. Did this solve your problem? or are there still issues? Yea there's the two separate profiles for healer and DPS but it's still kind of the same problem since I have to modify each one to get to where I want them to be. Again, not really a complaint since you can't anticipate every possible person's desire. I just wanted to say I am indeed enjoying your work and effort. The new updates are very nice. I think both of you are confusing each other on how the profile creation works now so I made a quick install video to catch you up to speed. It'll be up momentarily. Also, feel free to check out my discord if you have any questions or concerns. Last edited by Bmw309894 : 04-09-18 at 03:48 PM.